* For Canada, add $14 per year. International, add $20 per year. Your total will be calculated at checkout. Yes! 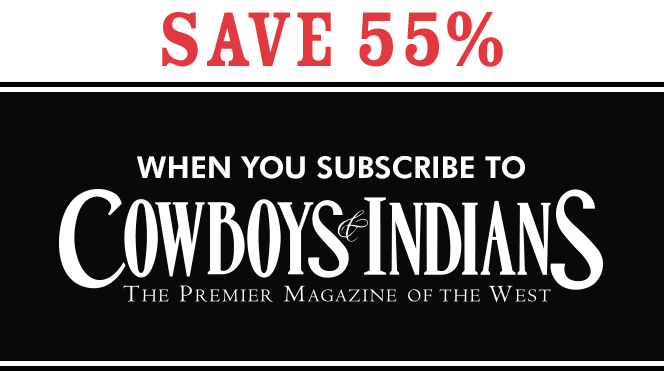 I would like to receive The Post, the weekly newsletter that features exclusive stories from CowboysIndians.com. This is a secure site for credit card transactions. C&I Advantage Guarantee: To reduce paper and guarantee uninterrupted service, your subscription will renew annually unless you ask us to cancel. Each year, you'll receive a reminder notice ahead of your renewal order transaction for the renewal rate in effect. You may cancel at any time and receive a refund on all unmailed issues. Copyright 2015 Cowboys & Indians. All rights reserved.